Not to go all Garfield on you, but the only thing worse than morning is a Monday morning. You wake up and for three blissful seconds you're not sure what's in store. The world is your oyster. For one fantastic, fleeting moment you think that maybe you'll take a walk in the park or go see one of those new motion picture films playing at the showhouse. And then it hits you. It's Monday. And there are responsibilities to attend to. I's need to be dotted, T's need to be crossed, and pixels need to be pushed. None of this would be true if you were a dog. If you were a dog you could probably just sit around and listen to the radio all day. The soothing sounds of Tommy Dorsey floating through the ether and into your ears. If you were a dog, this would be the best Monday ever. Because every day is the best day ever. Today, dear reader, I present to you six pictures of dogs listening to radio at the dawn of the medium. Some of the photos are dogs listening to broadcast radio, while others show dogs listening to communication radios — perhaps calling their doggy friends. Hopefully these little radio pups help make your Monday slightly less Monday-ish. 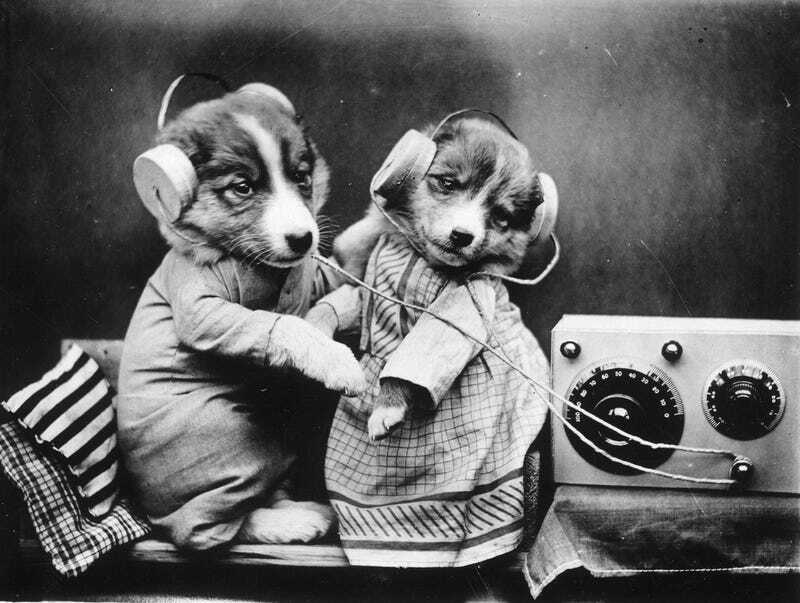 Because while Monday mornings are indeed the worst, photos of dogs listening to radio in the 1920s and '30s are the best.